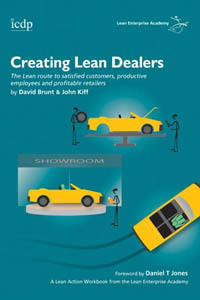 Creating Lean Dealers is a step-by-step guide to improving dealer operations, starting from service and repair. With 115 ring-bound pages of detailed instructions, it shows you how to create visual images to help remove the many barriers to the smooth flow of work in your dealership. This workbook is the result of almost ten years’ research and practical experience with pioneering dealers of all sizes and franchises across Europe – and shows how Lean can deliver a step-change improvement across your business.